Even veteran travelers to Northern California may not know about the wonders of the Mendocino Coast in fall and winter, and this time of year brings a particularly tasty treat –mushrooms. More than 500 edible varieties flourish there in season, including the succulently sweet candy cap mushroom. At the Little River Inn (www.littleriverinn.com), a Victorian stunner overlooking the Pacific, five generations of the same family have been treating guests to these earthly delicacies. 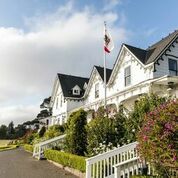 The inn has three deals at this time of year to allow you to discover the rich culinary history and breathtaking scenery that awaits you in Mendocino. There’s no better celebration of the season than the Annual Mushroom, Wine and Beer Festival, this year from November 3 – 12. Make the Little River Inn headquarters for your mushroom-centric journey. They feature daily mushroom specials at their award-winning restaurant and in the atmospheric Ole’s Whale Watch Bar. On Friday, November 10th, their CIA-trained Chef Marc Dym presents the inn’s Annual Mushroom and Belgian Beer Dinner, a multi-course meal featuring local mushrooms paired with handcrafted ale from Russian River Brewing Company’s Brewmaster Vinnie Cilurzo. Make reservations for dinner—and book yourself a room at the same time. In order to savor all of the festivities, the Little River Inn has a MUSHROOM MANIA rate. Stay in Seaside Luxury Rooms for $279 ($50 savings), Ocean View Deluxe Rooms for $215 ($40 savings), and Ocean View Gas Fireplace Rooms for $165 ($30 savings). Sun-Thurs, Nov 3 ‑ Nov 12, 2017; Two-night minimum. Call 707.937.5942 or 888.INN.LOVE. Locally-foraged abundance appears in Chef Dym’s dishes long after the festival is over, so if you can’t find time to taste Mendocino’s early fall flavors, don’t worry. When you book by November 15th for a stay between November 26th and December 21st (two-night minimum) you can take advantage of the WINTER SPECIAL and get 25% off any room. Book online using the code WINTER, but if online booking isn’t showing availability for your dates and room, call 707.937.5942. Must book by Nov 15 for a stay between Nov. 26 and Dec. 21; Two-night minimum. 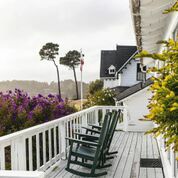 Little River Inn is a family-owned and operated boutique resort on the Mendocino coast of California with a chef-driven restaurant, nine-hole Audubon-certified golf course, professional tennis courts and day spa. Ideal for the entire family (and pet-friendly as well), the Inn has 65 guest rooms ranging from the economical to the luxurious. 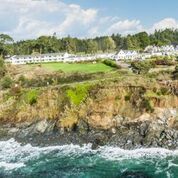 Several private meeting and special event spaces with stunning ocean and garden views make the Inn an excellent venue for small- to medium-sized weddings and corporate retreats. 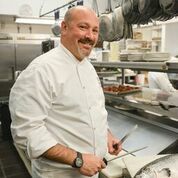 The restaurant, helmed by CIA-trained Executive Chef Marc Dym, is a destination unto itself and the delicious, often hearty California coastal cuisine has a following so dedicated that it is not uncommon for guests to fly in by private plane for Sunday Brunch. Ole’s Whale Watch Bar is a classic local hangout where guests gather for drinks and a casual bite. Little River Inn has a beautiful, nine-hole golf course that plays like 18 and is appropriate for many skill levels. The Inn also has a Day Spa with three treatment rooms and offers in-room services, and just recently launched a full-service salon offering pedicures, manicures, facials, and a hair studio. Overseen by fifth-generation Innkeeper Cally Dym, Little River Inn was proud to celebrate its 75th anniversary in 2014. Little River Inn is located two miles south of Mendocino overlooking the Pacific Ocean, at 7901 N. Highway One, Little River, CA 95456. For reservations and additional information, call 707-937-5942 or visit http://www.littleriverinn.com.